Heretic is a dark fantasy first-person shooter video game created by Raven Software, published by id Software, and distributed by GT Interactive in 1994. It was made available on Steam on August 3, 2007. 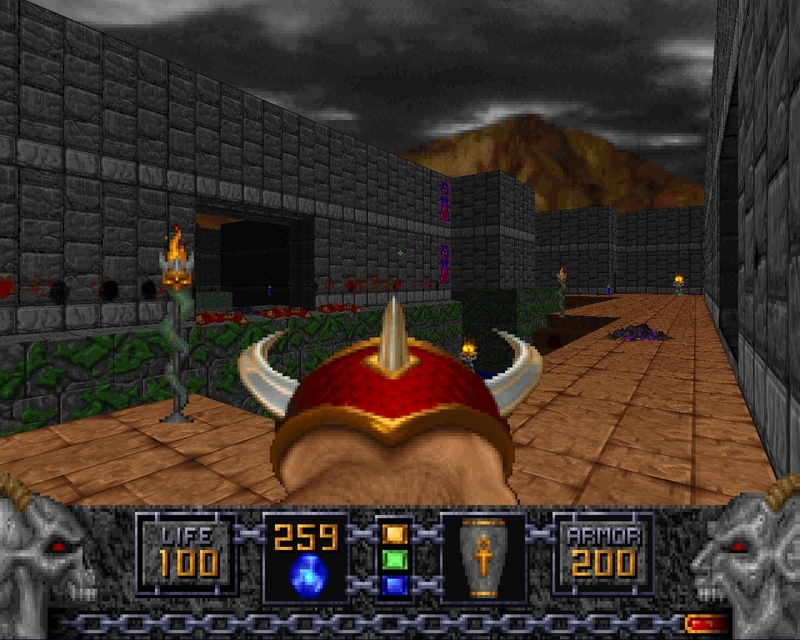 Using a modified Doom engine, Heretic was one of the first first-person games to feature inventory manipulation and the ability to look up and down. It also introduced multiple gib objects spawned when a character suffered a death by extreme force or heat. Previously, the character would simply crumple into a heap. The game used randomized ambient sounds and noises, such as evil laughter, chains rattling, distantly ringing bells and water dripping in addition to the background music to further enhance the atmosphere. An indirect sequel, Hexen, was released a year later. Heretic II was released in 1998, which served as a direct sequel continuing the story. All music in the game was composed by Kevin Schilder. Kevin Schilder is a video game composer. He mostly composes synthesizer scores for Raven Software video games. His style is quite similar to the John Carpenter style, especially in Take No Prisoners. He is one of two sound designers responsible for sound and music at Raven Software. He has been working with Raven Software since its inception but has been formally employed with the company since 1994.